laundries, taverns, bakeries and also farm ventilation. Can be used anyplace where a smaller amount of ventilation is desired. General Construction – Constructed with an integral motor-Propeller Fan guard mounted on a rugged steel panel. Aluminum blade assemblies are dynamically balanced and produce quiet, efficient air flow. Panels are painted in baked enamel. All units with totally enclosed long hour duty shaded pole motors with permanently lubricated sealed sleeve bearings. All models except PVL-8 and PVL-10 can be mounted horizontally as well as in the vertical position. All nits are equipped with a terminal box for permanent wiring to a remote control switch. The variable speed controller with a field adjustable control feature allows the user to set desired anti-stall or minimum speed levels. These speed controllers are available for all PVL exhaust Propeller Fans. DIA. FREE .1" 1/8" 1/4" H.P. HIGH SIZE WT. Performance shown is for PVL exhaust Propeller Fans without ducts. 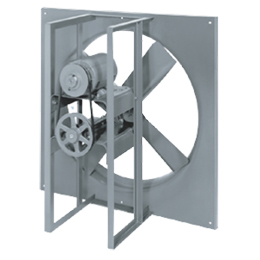 NIS-CO carries a full line of high quality, low maintenance Propeller Fans for any industrial application. Contact us today to get a quote on one of our Propeller Fans. rooms, kitchens, industrial ventilation or equipment cooling. High quality Propeller Fans for permanent installations with service free motors. 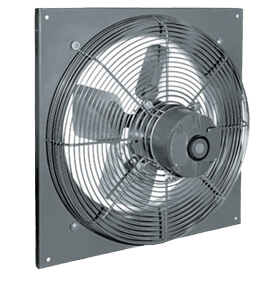 Models PVM and PVH are constructed with an integral motor-Propeller Fan guard mounted on a rugged steel panel. All blade assemblies are dynamically balanced and operate at high efficiencies in the deep drawn venturi of the panel. Sturdy square panels designed for ease of installation over rough round, or square openings by means of 4 lag screws or bolts. It is recommended that shutters be mounted on outside of building to protect Propeller Fan from weather and eliminate back-draft when Propeller Fan is not operating. Complete Propeller Fan unit finished in attractive baked enamel. Standard motors furnished are totally enclosed air over. All motors are equipped with pre-lubricated sealed ball bearings to provide years of service and facilitate Propeller Fan installation in any position. Single phase motors for PVM-16, 18 and 20 are split phase single voltage, 115 or 230 volts, both single and two speed. Single phase motors for PVH-16 and 18 are split phase single voltage, 115 or 230 volts. The PVH20 is 115/230 dual voltage. Three phase motors rated at 230/460 volts are also available on all models upon request. Discharge guards for all models are available. 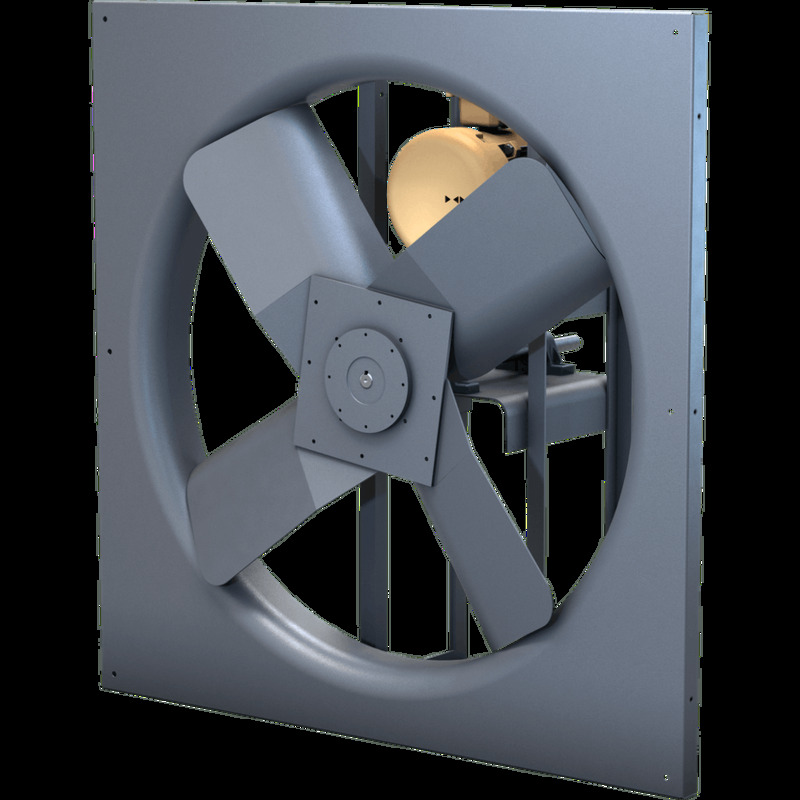 For slight additional charge, special reverse flow Propeller Fans are built for blowing into buildings. FA N D IA . Used for industrial ventilation, laundries, kitchen exhaust and farm buildings where large volumes of air are required or where Propeller Fans must operate against resistance, and may also be installed in duct installations where low static resistance is encountered. 1" 1/8" 1/4" 3/8" 1/2" 5/8" 3/4"
S.P. S.P. S.P. S.P. S.P. S.P. S.P. B.H.P. Used as heavy duty industrial ventilating Propeller Fans in steel mills, machine shops, packing plants, etc. or in duct installations where static pressure up to one inch is encountered. The panel and support arms are arc welded together for rugged construction. Blade assemblies are dynamically balanced and operate at high efficiency in the deep drawn venturi of the panel. The sturdy square panel is designed for ease of installation over rough round, or square openings by means of lag screws or bolts. Propeller Fan units are supplied with a heavy duty motor base which is adjustable to provide proper belt tension. Motor pulley is adjustable to provide lower Propeller Fan speeds, if required. V-belt drives are selected with conservative ratings to give long service. Because of the complete ball bearing construction, Propeller Fan units may be mounted in any position. Complete Propeller Fan unit finished in attractive baked enamel. Open drip proof continuous duty motors are standard equipment on all units. Totally enclosed and explosion proof motors are also available. Motors 1/3 HP through ¾ HP single phase, single and two speed, are resilient mounted ball or sleeve bearing. All other motors are ball bearing rigid mounted selected for quiet operation. Two speed motors 1750/1150 are available at extra cost. Self-aligning, single row ball bearing pillow blocks rigidly support the Propeller Fan on belt drive units. Computerized selections have been made on all bearings based on radial, thrust and combined loads to give 200,000 average life hours (AFMBA L50) at the maximum design RPM for each Propeller Fan. Bearings selected have effective seals to retain the lubricant and to prevent against contamination. All have grease fittings for re-lubrication. 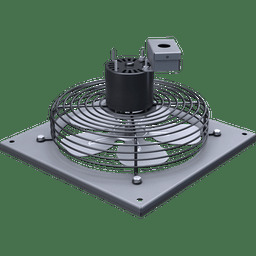 Special reverse flow Propeller Fans for blowing air into buildings; inlet and discharge guards are optional features available for a slight additional charge. For installation in hazardous locations, Propeller Fan units with explosion proof motors, non-ferrous blades and spark proof belts are available. *B.H.P. Does not include drive losses. Performance shown is for PVI exhaust Propeller Fans without ducts. 550. Shutter dimensions have been carefully matched to panel and venturi physical dimensions. Careful aerodynamic tests have been given both products to insure full catalog performance when purchased and installed as mated equipment. Dimensions shown on this page are intended as a guide only, and are subject to change. Certified dimensions will be furnished on request. NIS-CO’s Propeller Fans have been used in many industrial applications by companies across Canada, both large and small. Please contact one of our expert Propeller Fans representatives for more information today. Locate Propeller Fan to blow with prevailing wind. Fumes being removed must be replaced. Provide openings for entry of fresh air, intake areas must be at least 20% greater than exhaust Propeller Fan orifice. Locate intakes to take advantage of prevailing winds. Locate Propeller Fan with respect to intake to obtain maximum effect of fresh air sweeping over work areas. Consider possible suction effect of higher powered exhaust Propeller Fans located in other areas that may oppose the new installation. if it can be avoided. When unavoidable, separate by at least six Propeller Fan diameters. Where steam, excessive heat and odors are encountered, locate Propeller Fan as near ceiling as possible. If air over motor is hazardous, wet or corrosive, use an explosion proof motor. It may also be desirable to use an aluminum blade, or protective coatings. When quiet operation is a primary consideration, select a slow speed or two speed Propeller Fan. When exhausting air in cold weather a source of tempered make-up air must be provided.